The world heritage site is celebrating 100 years since it was gifted to the government. More than ten thousand people gathered at Stonehenge to witness the sun rise for the summer solstice. Approximately 13,000 people descended on the neolithic monument in Wiltshire to watch the sun rise at 4.52am - up from 12,000 last year. Jennifer Davies, English Heritage's general manager of Stonehenge, said they were "delighted" that so many of all ages came to celebrate the longest day of the year. We'd like to thank everybody who helped to make it another memorable and good-natured occasion and we look forward to seeing them again next year. We are pleased with how the celebrations have gone. Summer solstice at Stonehenge is a major operation and we couldn't do it without our partners, especially Wiltshire Police and Wiltshire Council." Armed police are on duty for the first time at Stonehenge for the Summer Solstice this morning. Bag checks and item restrictions are also in operation, with 25,000 people arriving from all over the country. The annual Pagan festival celebrates the longest day of the year. Security has been stepped up following the recent terror attacks in Manchester and London. Wiltshire Police: Stonehenge solstice - 2 arrests, largely a "... positive, friendly atmosphere"
Wiltshire Police have said that Summer Solstice celebrations at both Stonehenge near Salisbury and Avebury have been peaceful on the whole. About 12,000 people were at Stonehenge to see the sunrise on the longest day of the year. A 24-year-old man was arrested on suspicion of sexual assault and taken to Melksham Custody; a woman aged 33 was arrested on suspicion of of drink driving; and a man was given a fixed penalty notice for a drug offence. Around 400 people gathered at Avebury - there were no arrests. “The policing operation this year focused on protecting the monument and environment by maintaining the integrity of the road network, minimising any impact on local communities and ultimately supporting English Heritage to ensure a safe and peaceful event for all. "With an event of this size and nature a large amount of traffic is inevitable but our forward planning with Wiltshire Council, security staff and stewards, the Highways Agency and English Heritage meant that any issues were dealt with effectively. "These changes for Solstice 2016 have proved a great success, with people celebrating at Stonehenge in a positive, friendly atmosphere as they waited for the sunrise." People preparing to celebrate the Summer Solstice at Stonehenge are being urged to use public transport or lift share. Up to 25,000 are expected to visit the ancient monument today and tomorrow. Alcohol will be banned from summer solstice celebrations at Stonehenge this June - and there will also be a £15 fee to park at the stones. English Heritage say the new rules will encourage more people to car share or use public transport. Forty thousand people attended two years ago and the stones were vandalised. Money raised will go towards maintenance. 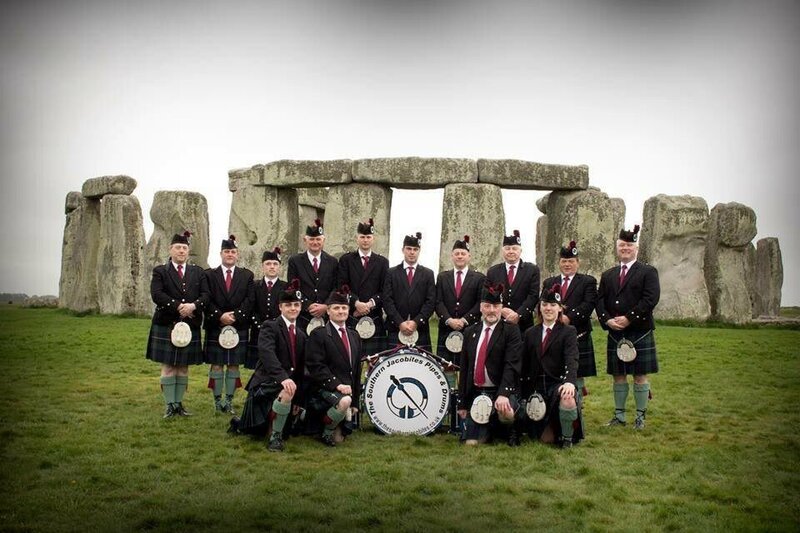 Members of the Southern Jacobites Pipe Band are playing their instruments at Stonehenge today. The musicians are marking International Bagpipe Day. Despite this morning's wind and rain, thousands gathered at Stonehenge to celebrate the winter solstice and see the sun rise on the shortest day of the year. From here, the days get longer. But cloudy skies made for a gloomy sunrise at precisely 8:04am this morning. But that didn't stop worshippers and partygoers from enjoying themselves. A warning Charlotte Saker's report contains flash photography. An exciting new discovery in the area around Stonehenge could be under threat from a proposed upgrade to the A303. Archaeologists have uncovered a stone age 'eco home' - built around the base of a fallen tree and using animal hides for cover. At 6,000 years old, the site is more than 1,000 years older than Stonehenge, but experts warn that this site and others like it could be destroyed by a planned tunnel in the area. Sam spoke to David Jacques (Archaeology project director, University of Buckingham) and Ian Wilson from the National Trust. Stonehenge voted a "must see destination"
The ancient landmark of Stonehenge has come second in a poll of the nation's 'must see destinations' for families. It was only beaten by the Lake District. In the voting Brighton Pier was second place where parents were most likely to have enjoyed with their children. The Lake District was voted the most desirable destination with 61% of parents rating it `must see'. Stonehenge and Cornwall came second and third respectively. The survey of parents with children under 16 was carried out by Freedomtogo.co.uk, a campaign spearheaded by the National Caravan Council and backed by The Caravan Club and The Camping and Caravanning Club. While the Lake District ranks as the most desirable location, only 41% have actually been. Parents are more likely to have enjoyed Cornwall (50%) and Brighton Pier (49%) with their children. Parents choose to holiday in the UK over trips abroad for the natural beauty of the region, to get on the beach and to be active as a family.